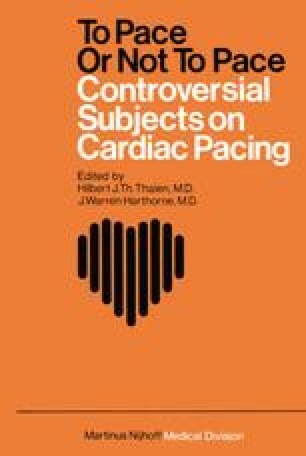 Who Should Implant a Pacemaker System, Cardiologist or Surgeon? The question, ‘To pace or not to pace’ stated by the theme of this symposium has gained increasing significance and implication. The electronic wizards, conceived in the aerospace industry and delivered in the competitive ‘think tanks’ of pacemaker manufacturers’ Research and Development Departments, have given us every manner of circuit design for simulating or even improving on the normal heart’s conduction system. There is little question that the future will witness a return to the use of atrial triggered ventricular systems in the vast majority of patients with heart block. Automatic conversion of atrial or ventricular tachyarrhythmias through biologic programmability is already a reality for temporary pacing systems and only awaits the perfection of a dependable atrial electrode before such devices will be ready for permanent implantation.